This article has been retracted. The retraction notice can be found here. Nanoparticles possess several advantages as a carrier system for intracellular delivery of therapeutic agents. Rapamycin is an immunosuppressive agent which also exhibits marked antiproliferative properties. We investigated whether rapamycin-loaded nanoparticles(NPs) can reduce neointima formation in a rat model of vein graft disease. Poly(lactic-co-glycolic acid) (PLGA) NPs containing rapamycin was prepared using an oil/water solvent evaporation technique. Nanoparticle size and morphology were determined by dynamic light scattering methodology and electron microscopy. In vitro cytotoxicity of blank, rapamycin-loaded PLGA (RPLGA) NPs was studied using MTT Assay. Excised rat jugular vein was treated ex vivo with blank-NPs, or rapamycin-loaded NPs, then interposed back into the carotid artery position using a cuff technique. Grafts were harvested at 21 days and underwent morphometric analysis as well as immunohistochemical analysis. Rapamycin was efficiently loaded in PLGA nanoparticles with an encapsulation efficiency was 87.6%. The average diameter of NPs was 180.3 nm. The NPs-containing rapamycin at 1 ng/ml significantly inhibited vascular smooth muscular cells proliferation. Measurement of rapamycin levels in vein grafts shown that the concentration of rapamycin in vein grafts at 3 weeks after grafting were 0.9 ± 0.1 μg/g. In grafted veins without treatment intima-media thickness was 300.4 ±181.5 μm after grafting 21 days. Whereas, Veins treated with rapamycin-loaded NPs showed a reduction of intimal-media thickness of 150.2 ± 62.5 μm (p = 0.001). CD-31 staining was used to measure luminal endothelial coverage in grafts and indicated a high level of endothelialization in 21 days vein grafts with no significant effect of blank or rapamycin-loaded NPs group. We conclude that sustained-release rapamycin from rapymycin loaded NPs inhibits vein graft thickening without affecting the reendothelialization in rat carotid vein-to-artery interposition grafts and this may be a promising therapy for the treatment of vein graft disease. Surgical bypass via autologous vein remains an evidence-based treatment of choice for selected patients with coronary occlusive disease or infra-inguinal lower extremity. However, contemporary data shows that almost 60% of lower extremity vein bypass grafts develop occlusive lesions or fail within a year , and almost half of cardiac bypass patients will lose (≥ 75% stenosis) a vein graft within a year . Neointimal hyperplasia, which develops immediately after grafting, is the most important early change of the grafted vein. Although not solely responsible for the graft failure, this neointimal process is to be regarded as the guiding track easing the development of fatal sclerotic changes  With the exception of aggressive lipid lowering,  no therapy has been shown to improve long-term vein graft patency in clinical studies. Earlier experimental studies such as placement of external porous dacron stents  or perivascular application of decoy oligonucleotides [1, 2] have failed to translate into clinical benefits because of early graft thrombosis and poor efficacy, respectively. Gavin and colleagues  have recently shown that immersion of vein grafts in rapamycin solution immediately before grafting inhibits neointima formation in porcine vein grafts; however, this effect is not sustained. Nanoparticles possess several advantages as a carrier system for intracellular delivery of therapeutic agents. These advantages include their subcellular size, good suspensibility, an easy penetration into the vessel wall without causing trauma, and the capacity for sustained intracytoplasmic release [7, 8]. Therefore, we hypothesized that rapamycin-loaded nanoparticles (NPs) could be an innovative therapeutic strategy for preventing vein graft failure. In this study, we have explored the efficacy of NPs as an intracellular ex vivo delivery system to the excised vein, and whether these NPs suppressed vein graft neointima formation in vivo. To our knowledge, however, no prior studies have examined whether rapamycin-loaded PLGA (RPLGA) NPs are useful as therapeutic strategy for preventing vein graft failure. Rapamycin was obtained from Sigma, St. Louis, MO, USA. Polyvinyl alcohol (PVA) 87-89% hydrolyzed, MW 31,000-50,000 was purchased from Advanced Technology & Industrial Co. Ltd, Hong Kong, China. Poly(lactic-co-glycolic acid) (PLGA) copolymer, monomer ratio 50:50, MW 20000 was purchased from Dai Gang Biology, Shandong, China. PLGA NPs containing rapamycin was prepared using an oil/water solvent evaporation technique based on a single emulsion method . Briefly, rapamycin was added to PLGA solution in Dichloromethane. The resulting solution was emulsified in 20 mL of 1% w/v PVA solution in PBS using a magnetic stirrer (Model 50-HI190M-1 Sciencelab. Inc. Houston, Texas. USA) and ultrasound probe 250W for 4 min, then the organic solvent was removed from the final emulsion by evaporation. The nanoparticle suspension was filtered through a 0.45 μm microporous membrane. Blank nanoparticles were also prepared by the same method without adding rapamycin at any stage of the preparation. The PLGA nanoparticles were stored at -4°C for further studies. Nanoparticle size and size distribution were determined by Dynamic Light Scattering methodology using Zetasizer (Model 3000 Malvern Instruments Worcestershire, United Kingdom). The analysis was performed at a scattering angle of 90 and at a temperature of 25°C using sample appropriately diluted 20 times with filtered distilled water (0.22 μm GV, Millipore, Ireland). The morphology of the nanoparticles was examined using transmission electron microscopy(TEM). A drop of the nanoparticle suspension was transferred onto a small metal cylinder. After drying, the sample was transferred in the sample holder of a Jeol JEM-1010 electron microscope(Tokyo, Japan). In vitro release studies were also carried out using dialysis bag diffusion technique . At predetermined time intervals, 500 μl samples from SLS were withdrawn from the incubation medium and analyzed for rapamycin with spectrophotometry as described above. After sampling, the incubation medium was replaced by fresh 5% SLS. A control experiment to determine the release behavior of the free drug was also performed. Rapamycin was dissolved in 5% SLS (13.95 μg/ml) and 5 ml of this solution was enclosed in a dialysis bag and was immersed in 100 ml 5% SLS, 37°C. Then, the procedure described above for the nanoparticle samples was followed. The vascular smooth muscular cells (VSMCs) were incubated in the growth medium containing RPLGA NPs (the rapamycin concentration: 50 ug/ml) for 1 hour. The cells were then washed with PBS and centrifuged for 8 min with 3000 rpm. The centrifugal cell were fixed in 2% glutaraldehyde dissolved in 0.15M phosphate buffer at pH 7.2 for 1 h, followed by post-fixation in 1% osmium tetroxide dissolved in 0.9% sodium chloride for 1 h. Fixed material was stained in bloc in 0.5% aqueous uranyl acetate overnight. After this procedure, the samples were dehydrated in graded acetone series, and embedded in Araldite resin. Ultrathin sections (70 nm) were obtained using a diamond knife in an LKB ultramicrotome, placed on 200-mesh copper grids and double-stained by uranyl acetate and lead citrate. The grids were studied and micrographed with transmission electron microscope, operating at 80 kV. In vitro cytotoxicity of blank, RPLGA NPs, and free rapamycin were investigated using the primary VSMCs culture. NPs were prepared under aseptic conditions. Rapamycin was dissolved in 96% ethanol. To obtain different test concentrations, several dilutions of nanoparticle suspensions were prepared with DMEM culture medium. Ethanol amounts used for dilution showed no influence on the cell viability during the experiments. VSMCs were seeded into 96-well microtiter plates (Nunclon™, Nunc, Germany) at a density of 4000 cells/well. After an incubation period of 24 h the culture medium was replaced with fresh, rapamycin, blank NPs, and RPLGA NPs culture medium. After an additional incubation time of 24 h the culture medium was replaced with fresh culture medium. After an additional incubation time of 48 h the viability of the cells was evaluated by the MTT assay (n = 7). MTT (3-(4,5-dimethylthiazol-2-yl)-2,5-diphenyl tetrazolium bromide) (Invitrogen, USA) was dissolved in phosphate buffered saline at 5 mg/ml and 20 μl were added to each well reaching a final concentration of 0.5 mg/ml. After an incubation time of 4 h unreacted dye was removed by aspiration, the purple formazan product was dissolved in 200 μl/well dimethyl sulfoxide and quantitated by a plate reader (Titertek Plus MS 212, ICN, Germany) at wavelengths of 490 nm. Male Sprague-Dawley rats (n = 25) (350 to 400 g; Slac Laboratory Animal Shanghai China) were anesthetized with an intraperitoneal injection of a 10% Chloral Hydrate (0.05 mg/kg), then a midline neck incision was made, and an approximately 1-cm segment of the lateral branches of external jugular vein was dissected free; all side branches were ligated. The vein segments were gently flushed, and placed in 1 ml solution containing either blank-NPs (n = 5), or RPLGA NPs containing rapamycin at 50 μg/ml (n = 5) for 30 minutes at room temperature. The operation was performed as described previously [11, 12]. In brief the treated vein segments were interposed into ipsilateral carotid arteries (everted over a cuff). Animals were killed with a lethal dose of anesthesia on days 21. The vein grafts were harvested, flushed with saline, and used for histopathologic studies. For histological analysis the animals underwent autopsy on days 21 (n = 5 each). The grafts were perfusion fixed with 4% phosphate-buffered formaldehyde via puncture of the left ventricle as previously described . The interposed vein segments were cut out at the cuff ends and fixed with 4% phosphate-buffered formaldehyde. Consecutively the veins were formalin fixed and embedded in paraffin. Sections of 4 μm thickness were stained by Hematoxylin and Eosin for measurement of the intimal thickness. The measurements were done using Digimizer 3.1.1.0 image analysis software (MedCalc Software, Belgium). For achieving reproducible results, the cross sections of the veins were divided into 4 quadrants. In each quadrant 3 measurements were performed. The median value of all measurements was regarded as representative for the intimal-median thickness. Evaluation of endothelial coverage within grafts was achieved using an immunohistochemistry stain for CD-31 as previously described. CD-31 antibody was obtained from Santa Cruz Biotechnology, USA. Reendothelialization was calculated as the percentage of luminal surface covered by CD31-positive cells 3 weeks after operation. Endothelial coverage was calculated as an average score over 4 sections per graft. To determine vein graft drug uptake and retention, vein grafts were removed at different time points after administration of NPs. Rapamycin levels were measured by high-performance liquid chromatography as previously described . Briefly, whole-blood samples (1 mL) or homogenized vein graft tissue were treated with precipitation reagent (methyl tert-butyl ether:I-chloroethane:methanol, 45:45:10) plus internal standard solution (32-0-desmethoxysirolimus) followed by C18 solid-phase extraction. UV detection of the absorbance peaks was performed at 278 nm, and values were expressed as micrograms per gram of dry tissue. The SPSS™ for Windows statistical software package (SPSS 17 for Windows, SPSS Inc., Chicago, IL, USA) was used for analysis. The value of MTT and intimal-median thickness is given as median ± 2SE. Comparisons of reendothelialization and histological measurements of the intimal-median thickness were made by the two tailed, unpaired Student's t test. Results were considered statistically significant at p values of less than 0.05. Rapamycin was efficiently loaded in PLGA nanoparticles reaching a loading capacity of 23 ug of drug to 1 mg of polymer and an encapsulation efficiency of 87.6%. Dynamic light scattering analysis revealed an average diameter of 180.3 nm (particle size range of 100-450 nm) for nanoparticles(Figure 1A). TEM showed a spherical shape for RPLGA nanoparticles (Figure 1B). The diameter of nanoparticles measured from TEM pictures was in the range of 100-300 nm, which was in agreement with the results of light scattering measurements. 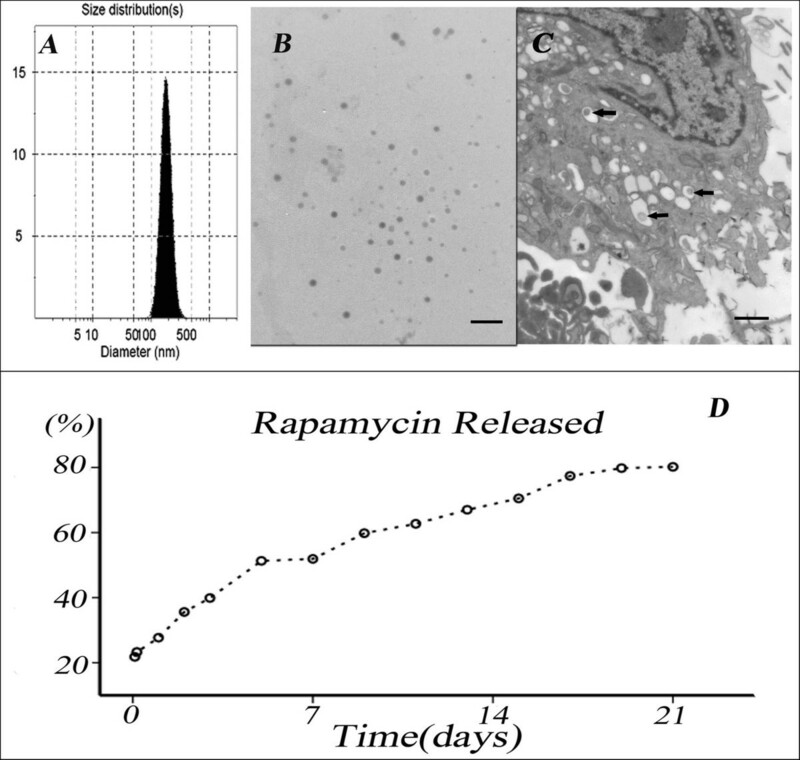 Characterization and in vitro release of the rapamycin from the RPLGA nanoparticles. A, Dynamic light scattering analysis for nanoparticles. B, Transmission electron micrograh RPLGA NPs. Bar represents 1 μm. C, Transmission electron microscopic picture of cross-section of VSMCs incubated with NP for 1 hour. Arrows indicate NP in the cytoplasm. Scale bar = 1 μm. D, In vitro release profile of rapamycin from RPLGA NPs. The percentage of rapamycin released was plotted against time. An analysis of the in vitro drug release kinetics from rapamycin loaded PLGA nanoparticles showed an early burst of drug release, approximately 27% of the total amount of drug, was observed on day 1, followed by sustained release that lasted for 21 days. During this period 80.2% of the drug was released (Figure 1D). TEM of the cellular cross sections revealed the intracellular localization of NPs after 1 h of incubation (Figure 1C). The MTT test served as an assay for proliferation and cell viability by measuring the mitochondrial activity of cells. The RPLGA NPs at 1 ng/ml significantly inhibited VSMCs proliferation (78.5 ± 5.74 vs 100 ± 3.01; P < 0.01). The effect of inhibiton was similar to that of free drug at 10 ng/ml(78.5 ± 5.74 vs. 79.1 ± 4.82; P = 0.85 Figure 2). There was non-antiproliferative character of unloaded nanoparticles prepared from PLGA(97 ± 6.79 vs. 100 ± 3.01; P = 0.35). In vitro effects of RPLGA NPs on proliferation of SMCs. Data represents mean ± 1SEM (n = 6 each) and percentage changes from control (100%). *P < 0.01 vs control. 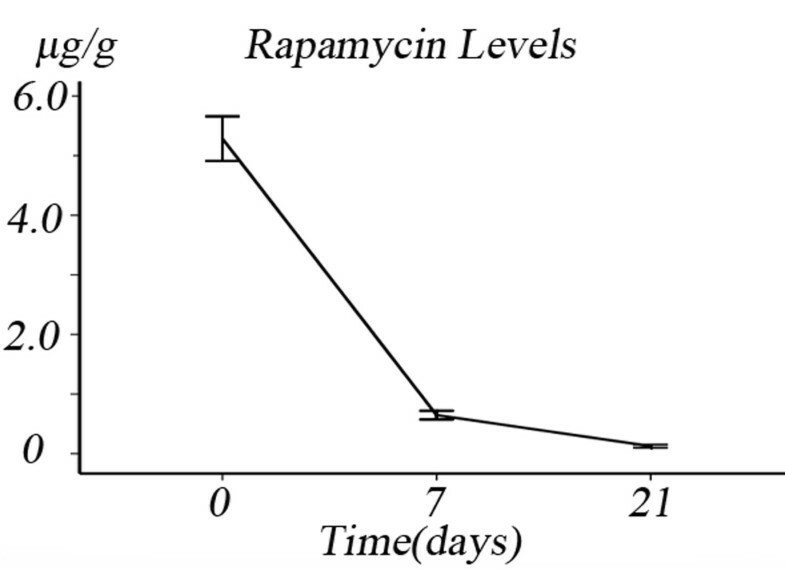 Measurement of rapamycin levels in vein grafts demonstrated the presence of drug in vein grafts at 0 days(after the vein being immersed in rapamycin-loaded NPs solution), 1 weeks and 3 weeks after grafting (n = 5) (Figure 3). The concentrations of rapamycin in vein grafts at 0 days, 1 weeks and 3 weeks after grafting were 5.4 ± 0.9 μg/g, 1.3 ± 0.2 μg/g and 0.9 ± 0.1 μg/g respectively. Rapamycin was not detected with high-performance liquid chromatography in whole-blood samples of any experimental animal, 1 week after grafting. Rapamycin Pharmacokinetics. Graph showing vein graft rapamycin levels at 0, 7 and 21 days after grafting. Bars represent mean ± 1SEM. The autologous interposition jugular vein graft was explanted and examined 21 days. Figure 4 demonstrates intima-media thickening at 21 days after implantation of the vein into the arterial circulation. The intima and media are measured together as the rat jugular vein has no well-defined boundary between the two. In grafted veins without treatment (controls, n = 5 at each point of time) intima-media thickness was 300.4 ±181.5 μm after 21 days. Veins treated with rapamycin loaded NPs (n = 5 at each point of time) showed a reduction of intimal-media thickness with 150.2 ±62.5 μm 21 days (p < 0.001 vs controls). Figure 1D demonstrates quantitative analysis of remodeling in this model, with increased thickness of the vein graft intima-media at 21 days. Effects of ex vivo treatment with rapamycin-loaded NPs on vein graft neointima formation and reendothelializaton in rats at 21 days. A and B, Vein graft sections of animals treated with PLGA NPs (left, control) and with RPLGA-NPs (right, treated), stained with Hematoxylin and Eosin. D, Bar graphs represent the morphometric analysis of vein graft sections about the inhibition of hyperplasia (intima-media thickness) in different treatment groups. Quantitative data derived from 3 vein graft sections at different levels from each animal in each group. *P < 0.001 for treated (n = 5) versus control (n = 5) groups. C, Endothelial coverage within grafts was achieved using an immunohistochemistry stain for CD-31. E, Bar graphs represent no significant effect of control or RPLGA-NPs group P = 0.8. Bars represent mean ± 1SEM. CD-31 staining (Figure 1C) was used to measure luminal endothelial coverage in grafts and indicated a high level of endothelialization in 21 days with no significant difference between control and RPLGA NPs group(88.2% ± 7.1% vs. 86.4% ± 7.5%; P = 0.8) (Figure 1E). In this study, we have demonstrated for the first time that PLGA NPs is an excellent system for intracellular delivery of rapamycin in excised veins. This NPs system is bioabsorbable polymer with a long history of safe use in medical applications. The RPLGA NPs was endocytosed rapidly by VSMCs. After cellular uptake of NPs, they slowly release encapsulated drugs into the cytoplasm whereas PLGA gets hydrolyzed, resulting in an intracellular drug delivery and thereby significantly inhibiting VSMCs proliferation. An important finding was, long-term release of rapamycin in the vein until day 21 after grafting which suggests that RPLGA NPs delivery system may be applied to human beings clinically. The bio-absorption time of PLGA in the body can be controlled by changing material make-up of PLGA, thus the function of the intracellular drug delivery system can be modified. Therefore, this NPs-mediated drug delivery system works as an excellent ex vivo delivery of rapamycin for the excised vein to prevent vein graft failure. Rapamycin is a macrocyclic, lipophilic lactone with immunosuppressive antibiotic activity derived from the actinomycete streptomyces hygroscopicus. The well-established effect of rapamycin are the inhibition of the progression of the cells from the G1 to the S phase within the mitotic cycle and VSMCs migration [14–16]. The drug is clinically used in transplantation medicine and as a coating of coronary artery stents. Rapamycin-eluting stents significantly reduce the incidence of restenosis and late loss of arterial luminal diameter . Schachner and colleagues  have shown in an experimental study that rapamycin could inhibit the development of neointimal hyperplasia in a mouse autologous graft transplantation model (vein to artery), with a peri-paravascular application of rapamycin applied locally in pluronic gel. With the use of pluronic gel some prolonging of drug contact to the graft could be reached but one disadvantage of this method, however, is the limited release time of the gel. As an example, Fulton and colleagues  found that after 5 days, 80% of antisense oligonucleotides to proliferating cell nuclear antigen (PCNA) were released from pluronic gel. In a recently published study Walpotha and colleagues shown a reduction of neointimal hyperplasia with a high dose of systemic rapamycin treatment (3 mg/Kg) either after 30 or 60 days in a rat infrarenal graft model. This dosage was similar to the one used in the transplantation model. However, they observed drug related side effects as well as a catabolic metabolism with lack of weight increase, which would limit the clinic use of this method . In our experiment we found that the proliferation of VSMCs was inhibited significantly by RPLGA NPs when the concentration of rapamycin was 1 ng/ml. The concentration was one-tenth of free drug. This shows that the PLGA nanopariticle increases the effects of rapamycin, which may be related to nanoparticles ability to increase the drug solubility and cell membrane penetration. At the same time, the rapamycin-loaded NPs can penetrate into the vessel wall easily ex vivo and sustained release the drug at least 3 weeks, so the early stage intimal hyperplasia of vein graft was inhibited significently. 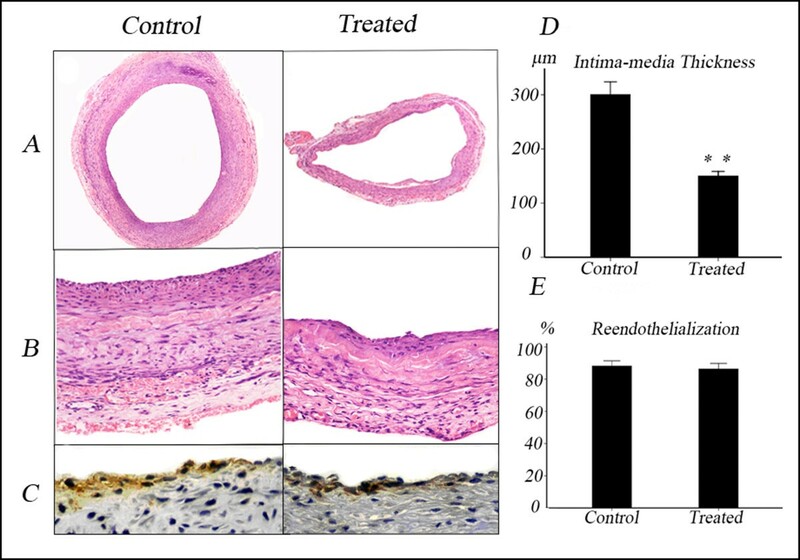 The study of Thirumaran and colleagues  have shown that periadventitial application of rapamycin-eluting polyvinyl alcohol microspheres to porcine saphenous vein-to-carotid artery interposition grafts inhibited vascular smooth muscle cell proliferation in 1-week grafts. The inhibition of vein graft thickening was not sustained; however, there was no therapeutic benefit evident in 12-week grafts. It may be related to the shorter time of drug retention (rapamycin was not detected at 28 days). Kawatsu et al  reported rapamycin-eluting biodegradable PLA-CL film applied externally can inhibit neointimal hyperplasia of anastomotic sites of arterial and vein grafts in a canine model. By the end of fourth week, the film had been completely absorbed; relatively drug retention time was also less. However, in our study the rapamycin was detected after 21 days, and the concentration was relatively higher, similar observations were made by Reddy et al wherein they have used cross-linked gel-like polymeric NPs for delivery system of rapamycin in injured artery . Because RPLGA NPs can easily penetrate into the vessel wall and their sustained release of rapamycin into cell cytoplasm, the inhibition to the intimal hyperplasia of vein graft would maintain for a longer durations. In our study, the rapamycin level in the vein graft was 5.4 μg/g after being immersed, and the level decreased during the first week but remained constant thereafter for the next 2 weeks. It is possible that the NPs localized in the intimal layer might have washed away with blood flow and the NPs localized in the adventitia diffused into the surrounding tissue after the initial localization, resulting in the initial decrease in drug level. However, the NPs localized in the vein graft were retained and able to maintain the drug level. Because rapamycin has been reported to suppress the adhesion of endothelial progenitor cells and their differentiation into endothelium . The biggest drawback of coated stent is adversely influencing the process of reendothelialization, thereby causing acute thrombosis. However, we have observed that the RPLGA NPs did not affect reendothelialization of the vein graft. One of the main reasons that stented arteries do not undergo reendothelialization very well is because of their direct contact with the intimal layer of the drug used to coat the stent, consequently either inhibiting the proliferation of endothelial cells or preventing adhesion and differentiation of circulating endothelial progenitor cells to the injured endothelium . The drug localized in the vein graft was probably not interfering in the process, allowing vascular repair to occur by the natural mechanism. In conclusion, sustained-release of rapamycin from RPLGA NPs inhibits vein graft thickening in rat carotid vein-to-artery interposition grafts 3 weeks, this does not affect the reendothelialization of the vein graft. Therefore, this NPs-mediated drug delivery system works as an excellent ex-vivo delivery of rapamycin for the excised vein to prevent vein graft failure. A retraction note to this article can be found online at http://dx.doi.org/10.1186/1749-8090-7-17. An erratum to this article is available at http://dx.doi.org/10.1186/1749-8090-7-17. The authors wish to express their appreciation to Liu Jianping, PhD, for her superb technical assistance during the preparation and characterization of RPLGA NPs. JZ designed study, analyzed and interpreted the data, and prepared manuscript. XZ contributed to study design, data analysis and interpretation, and preparation of manuscript. HY contributed to data collection, and preparation of manuscript. HM contributed to interpretation of data and manuscript preparation. YZ contributed to study design, and preparation of manuscript. SW contributed to study design, analyzed and interpretation of data and manuscript preparation. All authors read and approved the final manuscript.